Posted on August 12, 2018 August 11, 2018 by SherylPosted in FoodTagged recipes, tomato. Almost a meal on its own. Looks delicious. I agree – Depending upon the size of the tomato, it could almost be a meal. I do like a stuffed tomato. Our tomatoes are long gone now, but if a good fall crop comes in, I’ll give it a try. I continue to be amazed my how much the timing of when various vegetables and fruits are in season differs across the various regions of the US. Tomatoes are just coming into season here. That look really good! I just had some PA home grown tomatoes, which would be prefect for this recipe. The only tomatoes that I have left in the garden are little cherry tomatoes. This does look refreshing though! I always struggle to figure out when is the best time to post seasonal recipes since I know that I live further north than many readers. It sounds like I may have been a little late in posting this one. I would have guessed that tomatoes would continue everywhere until frost. You just post as you get your seasonal fruit or vegetables, as one can always save a recipe if they want to try it out!😀 I just pulled tomato plants up for I needed room to start my greens for the winter. I left a cherry tomato plant for my salads. I agree with you – The best approach is just to wait until it’s in season where I live; though I occasionally will buy a fruit or vegetable a little prior to it being in season here to make a recipe for this blog. That’s a fancy recipe! I had forgotten about the boiling water trick. The boiling water trick worked really well with this recipe. The peel slipped off easily, while leaving the tomato firm. 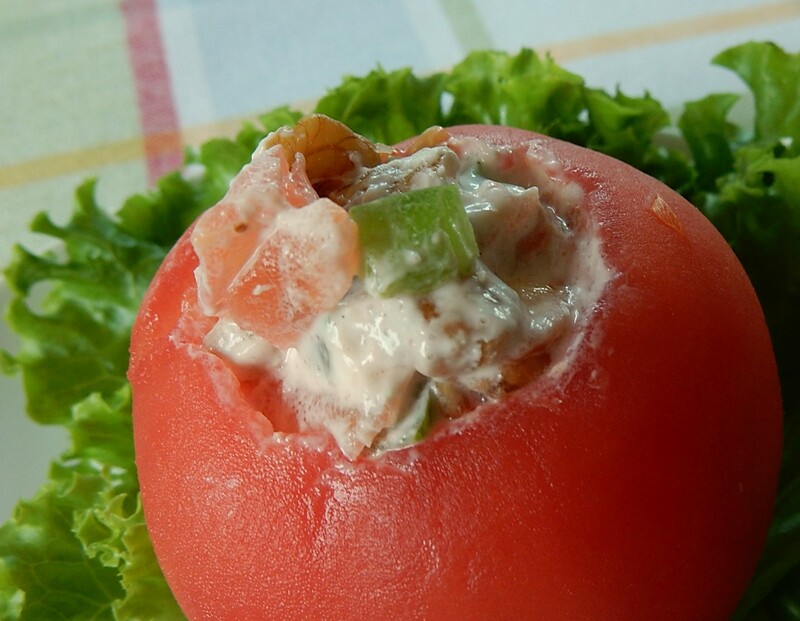 Great stuffed tomato. Thanks for sharing your find. You’re welcome. I think that you’d like this recipe.